Last Friday night we were sitting around the table as the freezing rain (not snow, thank goodness!) pounded on the skylights and the wind howled an ugly melody none of us wanted to hear. We had guests coming for dinner the next evening, and I had no idea what to fix. All of a sudden, it hit me. 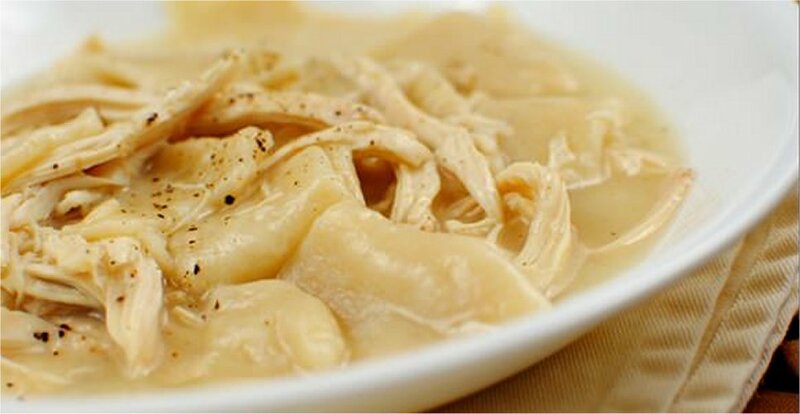 What more appropriate warm comfort meal than good ol’ Eastern Shore chicken and dumplings! Definitely one of Ben’s favorites, and something neither of our friends had enjoyed before. So chicken and dumplings it was! Except I had no chicken. No problem, just go buy one the next morning, right? That got a bit tricky, however, because when Ben went to the store for me, the first three grocery stores he went to were totally out of chicken. Seems the upcoming predicted snow storm produced a run on chicken. Who knew? Fortunately the butcher at the last store he visited said they didn’t have any whole chickens left in the meat department, but the deli department did. I guess the butcher felt bad for him when she saw the look of disappointment on his face as he explained how his wife had offered to fix chicken and dumplings for him, and he HAD to find a chicken! Of course, the deli department manager said they couldn’t sell the uncooked chickens because they weren’t cooked! Yes, that’s what he wanted them for…to cook! After some convincing by the butcher, the deli manager packed up two uncooked chickens for Ben, and he happily brought home his two prized birds! Ben grew up in the Midwest where they had chicken and dumplings as well, but the ones he’d always had were biscuits cooked on top of a pot of chicken. Not at all what we make on the Eastern Shore. When he first looked at my mother’s chicken and dumplings and saw this concoction of flat white squares of shiny dough, he wasn’t quite sure what he was supposed to do with them. He didn’t want to insult my mother, but, well he’d made up his mind that he probably wouldn’t like them. Surprise! They instantly became his favorite meal! 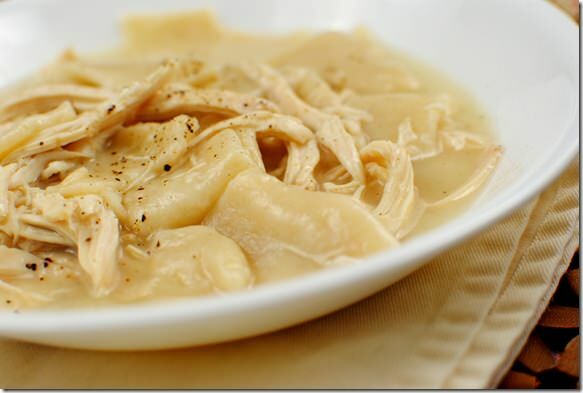 There were many Sunday afternoon family dinners when I was growing up that featured chicken and dumplings. LOTS of dumplings. My uncles would always argue good naturedly over who got the last bit of them, and there were never any left. And even better, when my grandmother would bake one of the chickens from her henhouse, sometime eggs would be inside; just the yolk, no shell. Now THAT was some good eating! And reserved for us kids only! I’ve fixed this for years, and introduced lots of friends to the joy of chicken and dumplings. Our daughter loves them, too, and they’re actually one of the first things I taught her how to fix. As a kid she liked rolling out the dough and cutting it into squares to drop in the chicken stock. If you’re counting calories, or carbs, this dish isn’t one you can eat too often. If you need gluten free, well, I don’t know which gluten free flour to recommend, or even if it would work with gluten free flour. That’s up to you to try, but be sure to let me know if you’re successful. 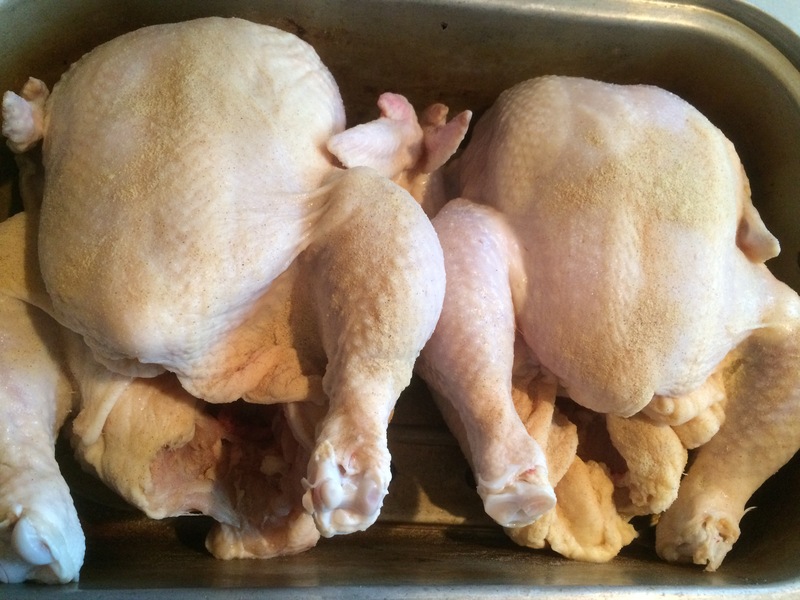 Bake chicken in covered roasting pan with a little water at 325 degrees until done, usually 30 minutes per pound. You can season it with salt and pepper, poultry seasoning, whatever you want. When chicken is done, remove to serving plate, cover to keep warm. Do NOT drain the juices from the pan, because that’s what you will cook the dumplings in, on top of the stove. I put the pan on the stove, lengthwise, over two burners, and bring the juice to a slow boil. You’ll probably need to add extra water to it so you’ll have enough for the dumplings. About 20 minutes before the chicken is done, start preparing the dumplings. How many you make depends on how many people you are serving. My rule is normally 1 cup of flour mixture per person. That’s it. Combine the ingredients, using a pastry cutter for the shortening. Add water slowly and mix enough in until the dough is a consistency to roll out. Roll out on a floured surface until it’s about ¼” thick (if you’re like me and using several cups of flour, you’ll do this several times, rather than using one big hunk of dough; trust me, it’s easier). Cut into 2”-3“ squares and drop the dumplings into the chicken juices. Since you’re making them in advance before the pan is ready, just stack them on a plate and cover until you’re ready to cook them. Cook 20 minutes. Scoop up into a bowl and serve immediately. With the chicken, of course! And don’t fight over who gets the last helping! Mmm mmm good! Chicken and (slick) dumplins were a staple in our house for sure. My mom gussied them up every now and then by adding frozen peas along with the dumplins. It was a great way to get my brother and I to eat them and it worked as I love them. Since my brother and I would fight over the gizzard whenever she fried chicken, she came up with the idea of buying a package of gizzards and pressure cooking them as they tend to be on the tough side. When they were nice and tender she used the broth in pressure cooker to make dumplins!! My brother and I were in “gizzard heaven”! Thanks for the memories! Now I have to have some!!! Frozen peas….that’s a great idea! I may try it. Gizzards on the other hand I’ve never cared for. And I wonder how many people reading this know what they are! Oh, so not fair, Deb! Now I have a Craving! Its been a long time since I’ve made or had ‘real’ chicken & dumplin’s! I made them last night as well!